Definition: An overreaction to foreign substances by the immune system of the eyes. The eyes react to a substance that the body perceives as harmful, such as pollen, animal dander, perfumes and cosmetics, some skin medicines, air pollution and smoke. Cells in the eye produce antibodies in an effort to protect the eyes, causing the symptoms of an allergic reaction, including itching, red eyes. Eye allergies are often hereditary and can surface at any age. Treatment for symptoms of eye allergies includes minimizing the source of the allergen, and certain medications. 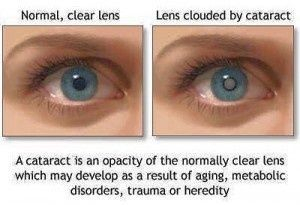 Cataract is a clouding of the eye's lens - the part of the eye that is responsible for focusing light. The lens is made up mainly of water and protein. Over time, protein can build up, clouding the light that passes through the eye, making sight blurred or fuzzy. For most people, cataract is a natural result of ageing. Often cataract develops in both eyes at the same time. The symptoms tend to be a gradual blurring of vision, which if left untreated can result in a total loss of sight. 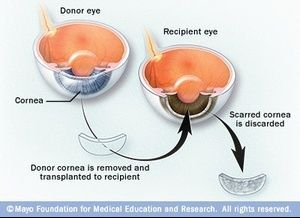 Corneal transplant: Replacement of a portion of the clear window on the front of the eye (cornea) with a healthy cornea. The procedure is typically done under local anesthesia in an outpatient setting. Transplantation of the cornea may be indicated in cases of severe scarring of the cornea by injury or infection (as with corneal ulcers) and in genetic disorders such as keratoconus (inherited corneal thinning with visual distortion) and Fuchs' dystrophy (inherited corneal clouding with visual loss). The very limited blood supply of the cornea greatly reduces the risk of transplant rejection. Corneal transplants generally function effectively for many years. LASIK: Abbreviation standing for laser-assisted in situ keratomileusis, a kind of laser eye surgery designed to change the shape of the cornea to eliminate or reduce the need for glasses and contact lenses in cases of severe myopia (nearsightedness). Before LASIK, the most common form of laser eye surgery was a treatment called PRK which involved scraping away the surface cells of the cornea before reshaping it with the laser. Unfortunately, the healing process after PRK tends to be very painful and can take weeks. Furthermore, both eyes cannot be treated at the same time and the patient must wait several months between treatments to allow each eye to recover sufficiently. LASIK is an ambulatory procedure done in an ophthalmology office or clinic. Numbing eye drops are used. The eyelids are held open so that there is no interference with the laser. The ophthalmologist creates an ultrathin flap on the front of the eye with a precise automated instrument. The flap is gently lifted and the preprogrammed laser then reshapes the inner cornea to refocus the eye. The flap is repositioned and holds itself in place, healing naturally without the need for any stitches. The laser pulses last on the average between 30 and 60 seconds. In all, LASIK takes about 20 minutes to do both eyes. The procedure is without much pain and recovery is quick. One may experience some mild discomfort and watering of the eyes after treatment. This varies from person to person but has been likened to the sensation of having worn contact lenses for too long. The risks associated with LASIK also include a small but real risk of an infection in the eye. No eye patch need be worn after LASIK. LASIK is now coming into use also to treat hyperopia (farsightedness) and astigmatism. LASIK does not treat or prevent age-related long-sight (presbyopia), which is due to the decreasing flexibility of the eye's lens that almost all of us experience as we approach our fifties and need to wear reading glasses. Women considering LASIK need to know that hormonal changes in pregnancy affect the cornea's shape and density and can complicate both the healing process and the success of LASIK. Women who plan to become pregnant within 6 months of LASIK surgery should not have the procedure done. An intraocular lens (IOL) is a lens implanted in the eye used to treat cataracts or myopia. The most common type of IOL for cataract treatment are known as pseudophakic IOLs which work by replacing the crystalline lens which has been clouded over by cataracts. The second type of IOL, more commonly known as a phakic intraocular lens (PIOL), is a lens which is placed over the existing natural lens used in refractive surgery to change the eye's optical power as a treatment for myopia or nearsightedness. 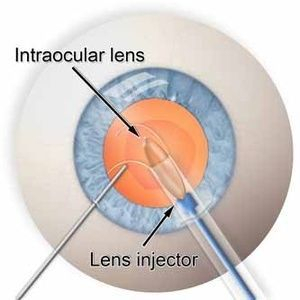 IOLs usually consists of a small plastic lens with plastic side struts, called haptics, to hold the lens in place within the capsular bag inside the eye. IOLs were traditionally made of an inflexible material (PMMA), although this has largely been superseded by the use of flexible materials. Most IOLs fitted today are fixed monofocal lenses matched to distance vision. However, other types are available, such as multifocal IOLs which provide the patient with multiple-focused vision at far and reading distance, and adaptive IOLs which provide the patient with limited visual accommodation. 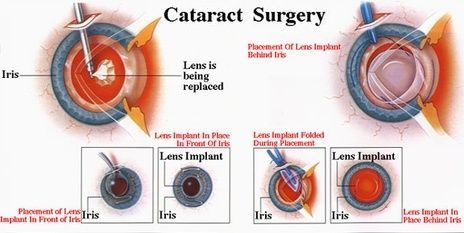 Insertion of an intraocular lens for the treatment of cataracts is the most commonly performed eye surgical procedure. The procedure can be done under local anesthesia with the patient awake throughout the operation. The use of a flexible IOL enables the lens to be rolled for insertion into the capsule through a very small incision, thus avoiding the need for stitches, and this procedure usually takes less than 30 minutes in the hands of an experienced ophthalmologist. The recovery period is about 2–3 weeks. After surgery, patients should avoid strenuous exercise or anything else that significantly increases blood pressure. They should also visit their ophthalmologists regularly for several months so as to monitor the implants. IOL implantation carries several risks associated with eye surgeries, such as infection, loosening of the lens, lens rotation, inflammation and night time halos, but a systematic review of studies has determined that the procedure is safer than conventional laser eye treatment. Though IOLs enable many patients to have reduced dependence on glasses, most patients still rely on glasses for certain activities, such as reading. Glaucoma is characterized by increased intraocular pressure , which affects the optic nerve and visual field. Indeed, the fluid in the eyeball (aqueous humor) does not drain more than enough and cause obstruction of the trabecular meshwork (exhaust filter) where an increase in eye pressure. Glaucoma is responsible for visual field loss, which can, if left untreated, lead to blindness. Several types of glaucoma: - glaucoma (open-angle glaucoma or), which is the most common form, grows silently. - acute glaucoma (glaucoma or angle closure) which remains relatively rare. - Other less common forms may exist : congenital glaucoma, secondary, that is to say, that occur after trauma to the eye. Glaucoma is associated with alteration of the fibers that make up the optic nerve (located in the posterior part of the eye) is involved in the processing of visual information and their transmission to the brain. Age: the risk of developing glaucoma is higher after 40 years and culminates to 70 years. 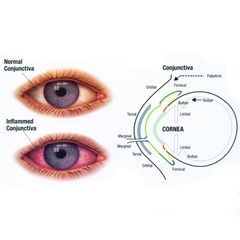 The occurrence of an event that may cause a significant increase in theintraocular pressure (injury, trauma brutal on the eye, intraocular infection, prolonged inflammation of the eye). Other risk factors : high myopia, imbalances in blood pressure (hypertension or hypotension), diabetes, prolonged use of certain medications (cortisone or other steroids), ethnicity (black-skinned people). The causes of glaucoma can be multiple. But realistically, how manifest glaucoma? How to identify the onset of glaucoma? Glaucoma gradually decreases the field and visual acuity (advanced). Peripheral vision (side) weakens; central vision and color are preserved longer. Both eyes are usually affected, but may be affected to different degrees. Several symptoms can indicate glaucoma: they vary depending on the form of the affection. However, this condition often goes unnoticed and remains asymptomatic for a long period. Chronic glaucoma (open-angle glaucoma or) is relatively common and progresses very slowly. Painless, it causes no symptoms initially, which is why early detection by an ophthalmologist is essential. Without treatment, it can cause blindness. Rarely, when the open-angle glaucoma progresses and manifesto, it can cause discomfort in the eye, reduced visual field, eye fatigue, nausea, headaches. acute glaucoma (or closure glaucoma angle) , rarer, is itself painful and appears suddenly. It causes serious eye pain (in or around the eye), a decrease in vision, eye hard and redness of the eyes, as well as headaches, nausea and vomiting. Vision is blurred and the person may perceive colored halos around bright lights.Emergency treatment is necessary because eye pressure increases rapidly involved: irreversible blindness can occur extremely quickly. specialist physician has several additional tests are simple and painless, to detect glaucoma or track. An ophthalmologist (or an orthoptist) may: - measure the intraocular pressure (tonometry) - perform an examination of the fundus to detect any damage - discuss the visual field, to assess the loss of vision, level of achievement and progress - use an additional examination called gonioscopy (or examination of the iridocorneal angle) to determine the type of glaucoma (chronic, acute, etc..) and the appropriate treatment. How to manage and treat glaucoma? Drugs as eyedrops: which stabilize the ocular pressure. Surgery: If the previous solutions are not enough, surgery may be sustained on the intraocular pressure by removing excessive (partially or completely) the exhaust filter of aqueous humor (trabecular meshwork). How to prevent the onset of glaucoma? The only protection is early detection. Glaucoma detected and treated early can prevent vision loss and, in parallel, to maintain their independence and quality of life. A regular eye exam is required: from 45 years, it is advisable to consult an ophthalmologist every two years. People who already have glaucoma or with risk factors must respect the frequency of consultation recommended by their ophthalmologist. The days of the vision held annually in October: enjoy free to evaluate your vision. these solutions help prevent future vision loss and prevent progression and worsening of glaucoma. 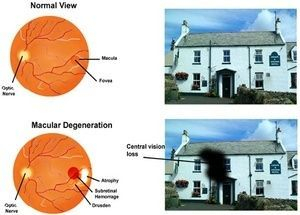 Age-related macular degeneration: An eye disease with its onset usually after age 60 that progressively destroys the macula, the central portion of the retina, impairing central vision. Age-related macular degeneration (AMD) rarely causes blindness because only the center of vision is affected. However, injury to the macula in the center of the retina can impair the ability to see straight ahead clearly and sometimes make it difficult to read, drive, or perform other daily activities that require fine central vision. The macula is in the center of the retina at the back of the eye. As we read, light is focused onto the macula where millions of cells change the light into nerve signals that travel to the brain and tell it what we are seeing. This is our central vision. With normal central vision, we are able to read, drive, and perform other activities that require fine, sharp, straight-ahead vision. There are two types of AMD -- the dry type and the far more frequent wet type. Neither type causes pain. An early symptom of wet AMD is that straight lines appear wavy. This happens because the newly formed blood vessels leak fluid under the macula. The fluid raises the macula from its normal place at the back of the eye and distorts vision. Another sign that a person may have wet AMD is rapid loss of central vision. This is different from dry AMD in which loss of central vision occurs slowly. In both dry and wet AMD, the person may also notice a blind spot. If any of these changes in vision is noticed, an ophthalmologist should be consulted without delay. Supplements of zinc and the antioxidants vitamin C, vitamin E and beta-carotene reportedly slow the progression of wet AMD. In people with intermediate-stage disease, zinc reduced the risk of the disease progressing to the advanced stage by 11%, and the antioxidants reduced the risk by 10%. When the two were combined, the risk was reduced by 19%. The daily doses of the antioxidants used in the study were 500 milligrams of vitamin C, 400 milligrams of vitamin E and 15 milligrams of beta-carotene (a molecule the body converts to vitamin A). The daily dose of zinc was 80 milligrams with 2 milligrams of copper. These amounts are well above the usual levels recommended by the Food and Drug Administration (FDA): 3 times as much vitamin A, 8 times as much vitamin C, 13 times as much vitamin E and 5 times as much zinc. For a fuller consideration of this disorder, see the article on Age-related macular degeneration.